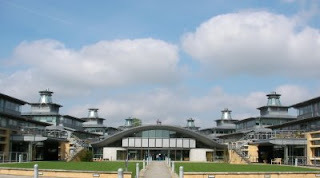 Back in conference season, I attended the Young Researchers in Mathematics conference at Cambridge (AKA Beyond Part III). This was my first time in Cambridge and it was good to see the maths building, of which I have heard a lot during my travels. Unfortunately, when I got there it appeared someone had parked a spaceship on top of it (picture below). 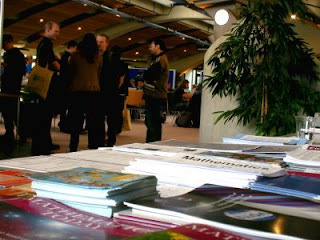 We exist to promote links between graduate mathematician communities at universities across the UK, and facilitate the organisation of conferences, workshops and social events for young mathematicians. The conference was part-sponsored by the IMA and so I ran a stall at the event (pictured below) and spent a good amount of time mingling. Below you will find a link to the conference photo on the Young Researchers in Mathematics website. Click to enlarge. I am almost in the middle towards the back, in a brown jumper and just behind the guy in green who stands out.